In other news, the two Christmas dinners I hosted went pretty well considering that Adam came down with a miserable fever the morning of the 24th, and I had to do all the things I had previously been counting on him for. According to the carnivores who came, this vegetarian did a good job cooking the ham. Nothing went wrong except I FORGOT TO PUT THE CROCHETED ORNAMENTS ON THE CHRISTMAS TREE. I am such a dingbat! I almost brought them downstairs a couple weeks ago but the dog started jumping up and down thinking they were toys, so I decided it would be a good idea to wait until she was asleep to sneak them onto the tree. After all that anticipation and big talking, I walked into my craft room this morning and saw them still neatly hanging from the pegboard where I was storing them. D'oh! Let's see, what else... I made the bottom half of a purse yesterday while vegging out on the couch, and I'm almost done with the scribbling scarf. Just a few more rows and it will be ready to photograph & upload. I've also done some sketches for another dog sweater (this one for my sister-in-law's new bulldog puppy) and I'll start on it as soon as I get his measurements. Lastly, I suspect my next batch of handspuns will contain lots of add-ins and goodies. I went a bit crazy at Walmart the other day buying beads, faux-pearls and shell fragments. Now that I have my orifice-free Mach1 spinning wheel, I can spin the bulky stuff in without any problems. As you can see, I was on a roll this week. Store update coming soon. As you may or may not remember, Adam and I have been toying with a program called Knitting Hero, a knitting game to be played on a PC with an XBOX 360 controller. It appears someone has beaten us to it (by a long shot--we were nowhere near done) and invented a knitting game for the Nintendo Wii. Part of me is thinking "Awesome! I can't wait to play it!" and the other part of me is thinking "Those rotten bastards stole my idea!" I suppose the fact that I announced it over a year ago and we're no closer to finishing the game kind of opens up the playing field, though, huh? Click here for Kniittiing's website. For the first time in a long while, I made this up as I went along and it came out exactly like I have envisioned it. I used 2 balls of KnitPicks chunky bare wool and size 11 needles. I cast on the neckline and worked 1x1 rib for a few inches, then began a cable pattern. I increased 2 stitches every row in the front until it was wide enough and long enough to cover her chest, then I bound off the front stitches and kept knitting the back until it was long enough to cover most of her. I picked up stitches and made 1x1 trim around the bottom edge, and made crochet-chains for the waist ties. I knit it loosely on purpose for two reasons: So I could knit it quickly and finish in time to use it during the current cold front, and because it hardly ever gets below freezing here, so I wanted it to be warm but not stifling. This has come back to haunt me because as she walks around, it stretches itself out to where the neckhole is around her chest and the bottom almost covers her feet. I hope to solve this by getting a little non-stretchy ribbon and weaving it through the neckline and tying a bow to hold it in place. I have decided I am officially one of those weirdos who is going to constantly have their dog wearing clothes. Luckily, she doesn't seem to mind. I didn't get anything knitted last night afterall, but I have started the plans for some kind of jacket/sweater/coat thing. I took the dog's measurements today and I'm going to start sketching ideas. I found a couple of really cute ones on Ravelry that I added to my queue, but who am I kidding, I know I'm going to end up making something on my own. Also, I'm still working on the scribbling project. I promise I won't forget to post my tutorial when I get it done. And I WILL get it done! I keep repeating to myself: This will not be a UFO, this will not be a UFO... In fact, that project is numero uno on my list (even above all spinning) at the moment, because my spinning wheels are so expensive. I still don't want to take any chances on the dog seeing a rapidly moving object and thinking they're giant wooden chew toys. Hey guys, sorry about my recent absence. 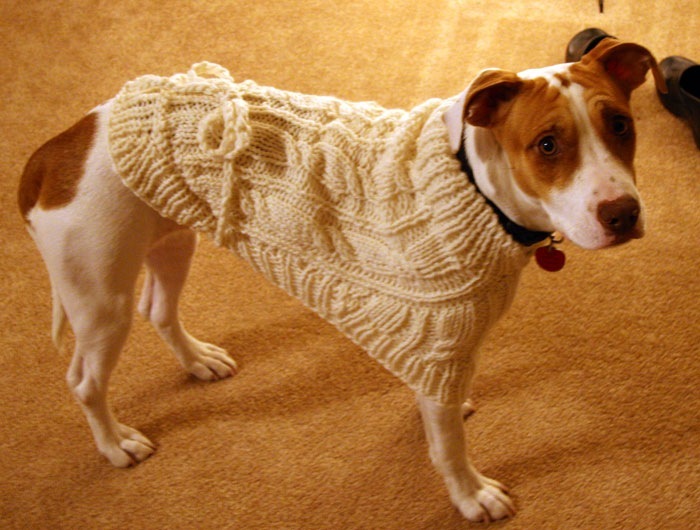 Since there isn't much knitting to tell you about, I'll tell you about the dog instead. We named her Bindi because the spot on her forehead mimics the placement of a bindi jewel, though everyone who asks her name says "Oh, like the Crocodile Hunter's daughter! Bindi the Jungle Girl!" I've just started smiling and saying "Yep!" She's a 15-18 month old Staffordshire terrier mix, and we adopted her from a local shelter. 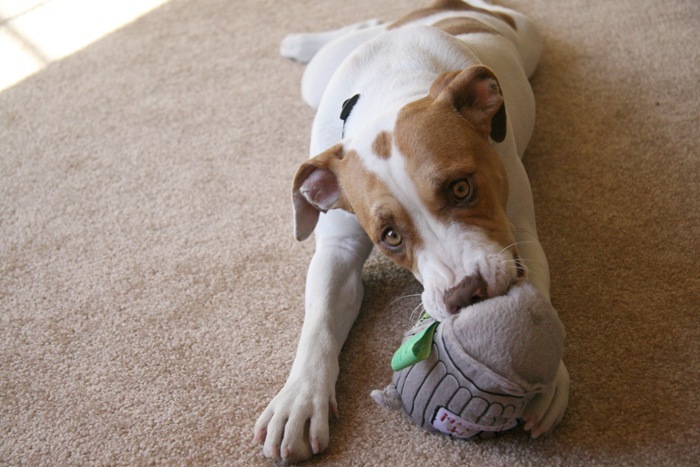 We suspect she's lived with a family before because she was already housetrained and is very well behaved. She's dying to meet the cats, but they're still a little suspicious of this new creature in their house. She's calm and affectionate (which is exactly what we wanted in a dog) but has shown some signs of dog aggression (which is kind of scary) so right now I'm limiting her exposure until after my appointment with a behaviorist at the SPCA on Tuesday. The main reason I'm not knitting or blogging is because my computer and crafts are both upstairs, and the dog has been confined to downstairs until now. (We were not allowed to bathe her until her spay incision healed, and she smelled really bad. We only wanted her to be able to stink up the bottom half the house instead of the whole thing.) We boarded her this weekend for our trip to Austin (company Xmas party) and they are giving her a bath Monday morning before we pick her up. Hooray! I think I'm going to knit her a little triangle-bandana tonight so she'll have something to wear until I can decide what dog sweater I should make her. Here's a bunch of pictures of her at my Flickr account.